MILLS RIVER, N.C.—A program that has fostered farm diversification, innovation and profitability in a midst of a transitioning agriculture economy is celebrating its 10th year of awarding grants to assist farmers. WNC Agricultural Options presented 29 farm businesses in western North Carolina a total of $153,000 Thursday at an event at the Mountain Horticultural Crops Research and Extension Center in Mills River. N.C. Tobacco Trust Fund Commission has been WNC AgOptions’ sole funding source since the program’s first grant cycle in 2004. This year, 22 farm businesses received $6,000 and seven received $3,000. All of the projects provide demonstration of unique approaches to farm enterprises to other growers. Neal and Ava Morgan of Shady Place Farms in Leicester are constructing an on-farm building where customers can purchase freezer beef. They aim to make the store a destination experience where customers can see first-hand where their food is grown and leave with a sense of the excellence in their farming conditions. 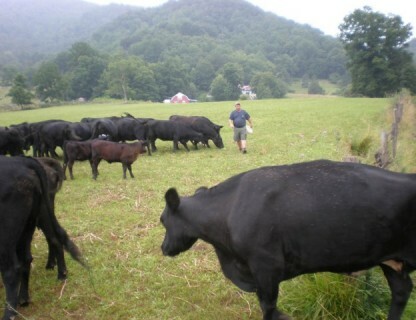 The Morgans are expanding upon a 2009 WNC AgOptions grant with which they perfected a recipe for homegrown feed that they produce in an on-farm grinder. Finishing their cattle with their own recipe, which they tailor to their customers’ taste preferences, significantly increases their bottom line. Joe Evans of Paper Crane Farm in Mars Hill is purchasing specialty tillage equipment called an articulating spader that enables him to improve the condition of his soil as well as expand into root crop production, boosting winter sales. Spaders prepare garden beds in a gentle manner, preserving the integrity of soil structure as well as preventing or shattering hard pan. In the heavy rains of 2013, Evans lost a significant portion of his carrot crops to rotting because of the hard pan’s inability to drain. Evans, 27, began farming on his own in 2011 after learning from and working with other western North Carolina farmers, including former WNC AgOptions recipients Green Toe Ground in Burnsville and Let it Grow Organic Gardens in Spring Creek. He expects this grant project to boost his income so that he can farm fulltime even in the winter months. 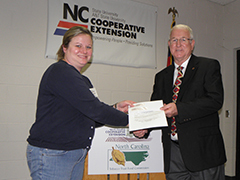 This year, WNC AgOptions welcomes new counties to its now 22-county/unit coverage area, with awardees in Rutherford, Burke and Caldwell counties. Lisa and Brandon Higgins of C-Saw Hill Farm in Rutherfordton are installing a solar hot water system as part of their new dairy, where they plan to milk approximately 10 cows to produce cheese. Hot water, heated in a solar panel on the roof, is used to pasteurize milk. Lisa Higgins of Rutherfordton receives her grant from Bill Teague of Leicester, Chairman of N.C. Tobacco Trust Fund Commission. Since 2004, WNC AgOptions has distributed more than $1.75 million to farmers in western North Carolina who are diversifying their operations. The fruits of the initial investments are often immediate, as new income typically matches the size of the grants in the first year of the projects. Data from 156 farmers who received grants in the past four years reveals that their projects resulted in a total of $1.15 million of new farm income in the first year alone. Revenue continues to increase year after year, doubling by the third year of the projects. N.C. Cooperative Extension executes the WNC AgOptions program, and Agriculture Agents work directly with farmers as they complete their projects. The administrator of WNC AgOptions is WNC Communities, a non-profit organization that has been improving agriculture in the region since 1947. WNC Communities provides a unique forum for leaders in western North Carolina to carry out innovative programs to improve the quality of life for rural communities and to enhance the agriculture economy. 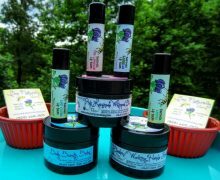 See http://www.wncagoptions.org/2014-topics/ to view a full list of recipients with links to descriptions of the projects.